I’m back! Back to the blogosphere, back to Spain! 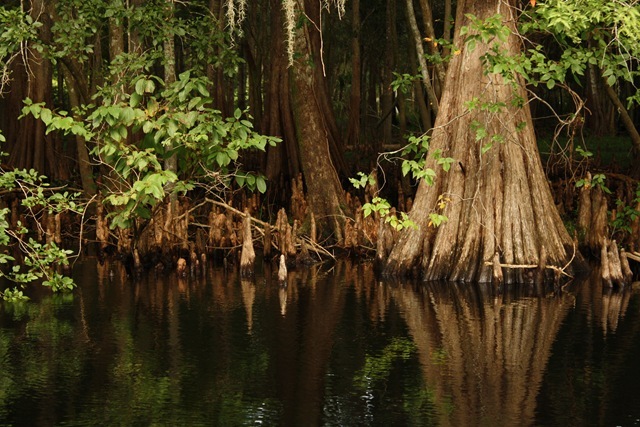 Yet as I look out my window at the bright and dusty landscape of late summer Murcia, I long for a few more breaths of swampy, tropical Florida. 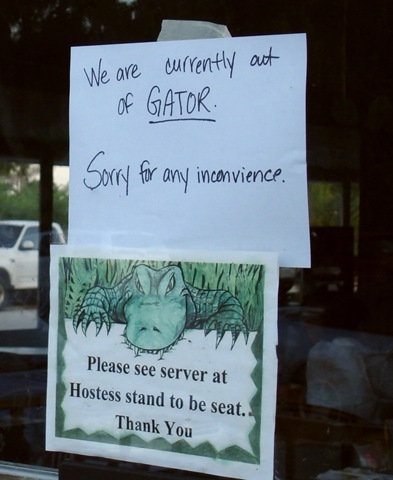 My first adult hopes for eating gator were dashed by this hastily written sign, “We are currently out of GATOR. Sorry for any inconvience [sic].” I grumbled, and then I laughed. Life is full of subtle ironies, but this was blatant. For right behind us was Lake Jesup, one of the most gator populated lakes in the state. And the restaurant’s gator-themed setting had only served to increase the anticipation. Yet, in spite of the gator hunting bravado of the decor, the hunt-to-table movement had yet to arrive to these here parts. While disappointed, my mom, brother and sister-in-law and I were also hungry. There wasn’t much else around in any case, and we certainly weren’t prepared to catch a gator ourselves. We settled on chicken fingers, which my brother quipped tasted like gator. Nonetheless, I couldn’t help wishing the greasy, battered, gator-like bites I was popping into my mouth were the real thing, even if I likely wouldn’t have been able to tell the difference between the reptile and the fowl in a blind test. These days, gator is a pretty common item on menus around the state, particularly at establishments next to lakes and rivers. There’s even a gator-centric food truck that cruises the streets of Orlando. Yet I hadn’t set the intention to try gator again until my most recent visit this summer as my mom and I planned a trip into rural Florida. 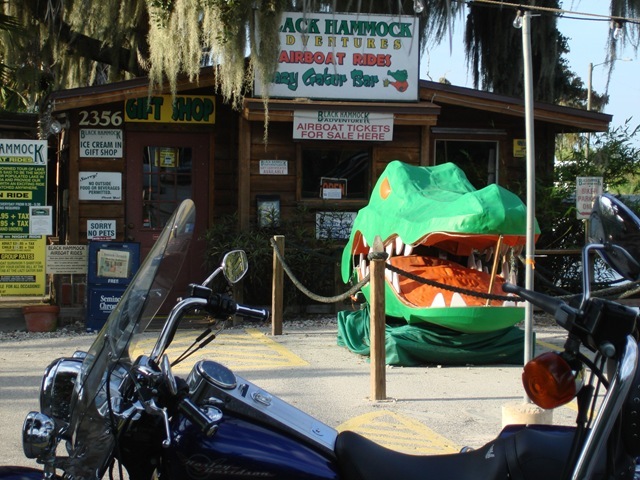 As our itinerary took shape, memories of the time I almost ate gator sprang to life. The story continues in Gator Tales Part II. Previous PostOne a Penny, Two a Penny… Monas de Pascua!